Will is twelve years old and he's just killed a man. Now he's on his own, on the run, determined to discover the truth about his father disappearance. Then Will steps through a window in the air into another world, and finds himself with a companion - a strange, savage little girl called Lyra. Like Will, she has a mission which she intends to carry out at all costs. But the world of Cittàgazze is a strange and unsettling place. Deadly, soul-eating Spectres stalk in its streets, while high above, the wingbeats of distant angels sound against the sky. And in the mysterious Torre degli Angeli lurks Cittàgazze's most important secret - an object which people from many worlds would kill to possess. Although The Subtle Knife is the second instalment in the trilogy, Pullman tugs the direction of our journey strongly on to another path. Everything we’ve learned and become accustomed to in Northern Lights feels like an old dream, as new and baffling components are introduced, and we’re transported across a multitude of different worlds. Most of all, Lyra appears very little, as our new protagonist takes the helm. It’s like a completely new story, which is a genius move in maintaining our wonder and awe in the worlds Pullman has built. Each chapter differs in its narrative, giving us a rounded view of Pullman’s cast of characters and their experiences. Multiple voice always gets a big tick from me, and I was particularly pleased to see the majority of chapters were fixed upon side characters, rather than our two protagonists. Yet, The Subtle Knife felt slightly lacking in the creation of an utterly spellbound feeling in me, in comparison to what Northern Lights evoked. Pullman delves heavily into physics and religion; in explaining the first in depth, and in implying the problems with the second, he refuses to patronise his readers, but also turns a deep fantasy series into a philosophical religious commentary. I can accept armoured bears and elephant type things on wheels, but as soon as angels are mentioned, I am completely disengaged. 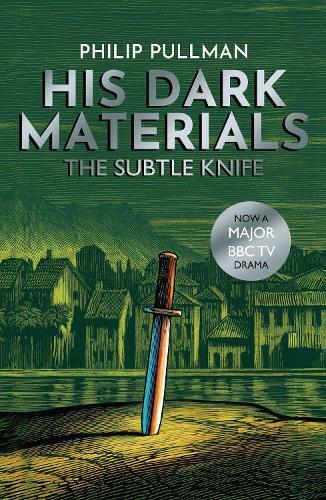 I loved the introduction of Will, of the knife, and even of the biblical elements three of the characters symbolised. I’m just unsure of the religious path the plot is taking, to the detriment of the genre. Nevertheless, this is the middle book in a trilogy, always difficult to review, and sometimes even difficult to understand. I shall focus my attention on The Amber Spyglass with fingers crossed for a reduction in theological debate.